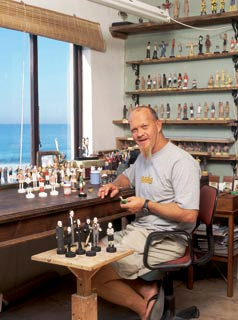 Darren at his desk in his studio at 77 North Beach Road, Umdloti, overlooking the ocean, surrounded by his various concepts. Darren Aiken is a Miniature Portrait sculptor. His pieces vary in size from 45mm to 160mm. Subject matters vary from Celebrities to Everyday People. Darren specializes in Portrait Chess Sets, Custom works based around your Board of Directors, Family Portraits, Special once-off gifts of Bridal Couples or Collections of Friends. Darren’s work is owned by, amongst others, Nelson Mandela, Ruby Wax, Alanis Morisette, Faye Dunawaye, Prince William, Ernie Els, Anthony Robbins, Standard Bank of South Africa, Jonnic Entertainment, Anglo American, Investec, and various corporate leaders and individuals. Anybody can buy Darren’s work or commission him, Darren sculpts for ZAR 1200 per individual piece (original polymer clay in full indelible colour). Stock reproduced limited Chess Sets from ZAR 3500 to ZAR 5000 and Commissioned Original Chess Sets from ZAR 18000 upwards. (32 originals in polymer clay in indelible colour. Please feel free to browse this site to sample and order Darren’s unique work.